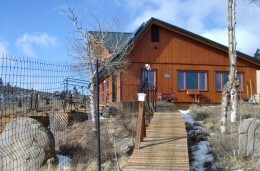 The freedoms of living off-the-grid can be rewarding as well as comfortable. 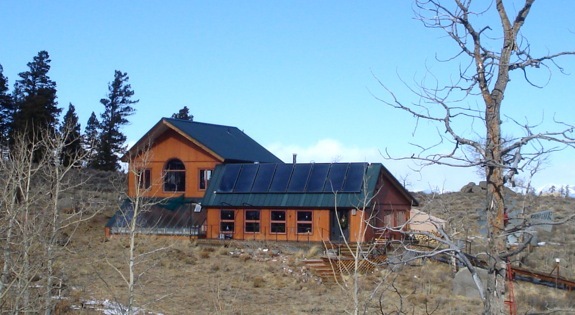 This article focuses on the electrical and active solar systems that augment the efficiency of the previous post that featured the design of the passive solar home. It’s a textbook-perfect passive solar home because they utilized all the design principles of efficient passive solar building that also included a lot of thermal mass and southern facing windows, a greenhouse / heat sink and even a masonry heater. 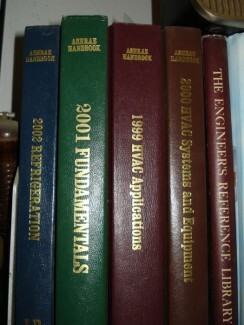 This article will look at the solar thermal hot water, solar electric as well as backup electricity generation systems. The solar thermal panels are seen on the roof on the right-hand side. Starting from the roof, a visitor will see that there are solar thermal hot water panels that collect heat supplied by the sun. The solar heated water travels inside to the utility room and into a tank where a heat exchanger allows the transfer of the heat into the water within the tank. Insulation surrounds the 500 gallon tank which is a closed-loop, gravity fed, water drain-back system. 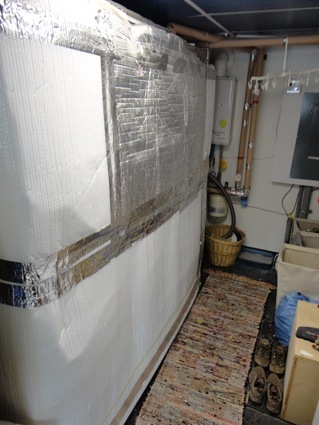 Behind this insulation sits a 500 gallon water tank that acts as the heat exchanger. They opted to use a closed-loop water drain-back system because water has a greater heat absorption capacity than glycol. Whichever heat transfer medium is used, they work similarly in that they act as the medium to collect solar heat. After collecting solar heat through panels or tubes, the water or glycol travels through pipes to a large water tank that acts as a heat exchanger. This gravity fed water drain-back system is calibrated to function automatically so that when a temperature difference is sensed between the temperature that is being collected outside, and the temperature within the tank, the system drains back into a section within the tank. For example, when the temperature collected in the panels continues to exceed the temperature within the tank, the system continues to run through the panels to collects solar heat and discharges the excess heat in the tank. When the temperature collected outside from the solar thermal panels drops below the temperature within the tank, the system drains back into the tank so that freezing within the pipes does not occur. 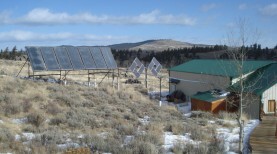 There are many other functions of this house that make it super efficient, yet its high level of efficiency is unique among off-grid solar homes. Because off-grid homes make their own electricity from naturally occurring elements like the sun or from wind, they typically have various systems of back-up for both hot water, heating and electricity generation. 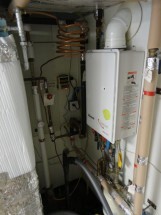 Also tucked within the utility room is an on-demand propane flash water heater, located to the upper right hand side of the picture. If there is a situation where there are several cloudy days in a row, if hot water is needed by the household, it is heated in the flash hot water heater before being utilized for domestic applications. 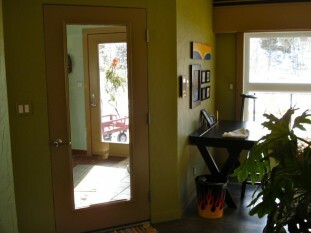 The passive solar house has been efficiently built with southern facing windows and thermal mass in the floors. It is also well insulated to help it keep a constant temperature. These elements help to keep the house warm in the winter, but at an elevation of 9,000 in the mountains of Colorado, it can sometimes get cold on a winter night. To help heat the home, there are two wood burning stoves: one in the main living room and the other is a masonry heater located near the kitchen. 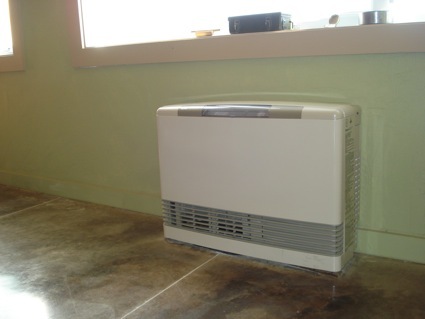 This back up heater is located on the eastern side of the home, near the double entry. There is only one backup propane gas heater that is set to automatically turn on if the home’s temperature dips below 55 degrees. I was told that it has rarely been used in the 10 years since the house was built. 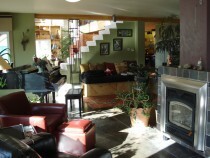 A well-insulated and built passive solar house will be warm in the winter, while it will also be cool in the summer. The overhang of the roof blocks the summer sun from entering through the southern facing windows. 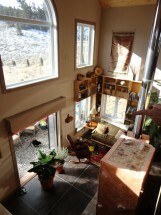 They also situated the windows in the passive solar house to facilitate air flow. 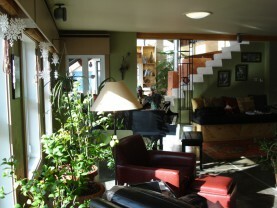 The windows on the lower and upper level can be opened simultaneously to allow the warm air to leave the house through the windows on the second floor. Other systems have also been put in place and optimized for maximum efficiency. Notice how the fireplace has tile around it? It increases the thermal mass of the stove. Because the home is passive solar, well-insulated and reliant on solar or other backup heat, each wood burning stove has its own regulator for air. This was done to make sure that the house does not experience negative pressure. When a house is negatively pressurized, it will pull air into the house through tiny crevices or cracks. This phenomenon is referred to as ‘crack infiltration’, and many people often disregard this naturally occurring phenomenon. But it is based on physics. No one can escape the rules of physics. One must remember that all common elements will seek equalization. Fires or other combustion-based appliances need oxygen to burn and in a tightly insulated house, as the fuel burns and uses oxygen, it will become negatively pressurized. As this happens, the combustion process needs more gas or wood fuel to burn as less oxygen is available. Simultaneously, the home will seek equalization by pulling oxygen through any and all available cracks. This is a bad thing on many fronts. It creates an inefficient home atmosphere as more gas or fuel is needed, and gas can build up within the house. 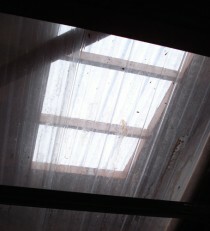 As air is being pulled through cracks, moisture will also enter the house. Moisture typically corrodes and is not a good thing to have in walls. A switch in the entryway controls the flume for the wood burning stove. To avoid ‘crack infiltration’, they installed a switch that controls the stove flume. The picture shows the control on the wall of the double door entry room. 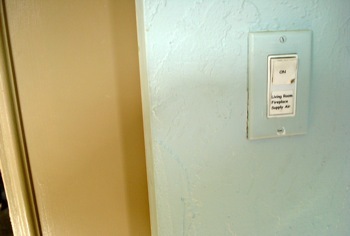 Conveniently located, it allows the switch to be turned on when returning to the home before starting a fire. Avoid a negatively pressurized house and the perils of crack infiltration. This house beams with luxury and convenience, making it is easy to forget that this house is off the grid and produces all of its own electricity. The house (on the left-hand side) is located a short distance from the main mechanical systems located in the shed to the right-hand side of the picture below. There are both solar photovoltaic (PV) panels to produce electricity and solar hot water panels to provide heat. The home is located on the left hand side of the page. The generator is located in the shed on the right hand side of the picture. The clockwork efficiency deployed to plan and build this house is impressive. These solar panels power the house will all the electricity that it needs. The mono-crystalline photovoltaic panels are located just past the utility garage. The PV panels create a flow of electricity that is stored in 2 volt industrial batteries. Batteries are necessary in an off-grid house to store the electricity generated from the solar PV. The batteries make the electricity available when it is needed. The battery bank is partly what makes this house distinct from other houses that I’ve seen. The batteries have plates that are twice as thick as regular batteries and are the type of batteries used in fork lifts. 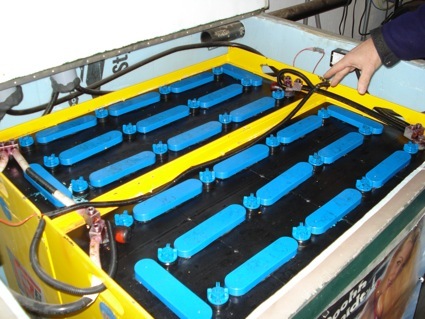 This type of battery has the ability to quickly discharge a rigorous output of electricity. The battery bank that stores electricity for the home. The batteries are built in a series of 12, to create 24 volts in the two battery banks. This was done for the following reason: when a battery bank’s electricity storage is drained below 50% of its capacity, a cycle it taken off of its overall life. 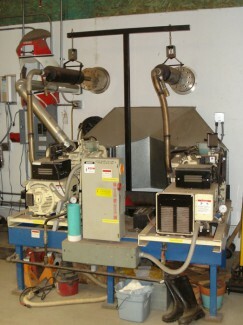 The two battery banks are wired in parallel to create one large battery bank that increases its overall capacity. The house and these battery banks have been in use for 10 years, and the owner does not anticipate ever needing to change out the batteries. 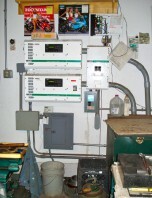 Two inverters were utilized; one acts as backup. 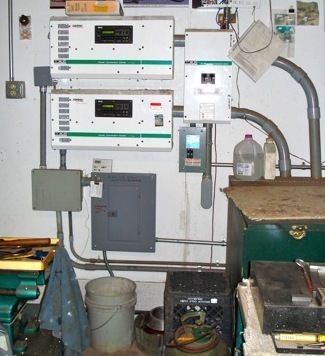 As a side note, one of the owners expressed wonder as to why so many off-grid owners use the red L – 16 Trojan batteries. They aren’t as strong, yet everyone seems to want and use them. If you’re having trouble sleeping at night, you could philosophize about why this phenomena exists. Is it because the first off-grid user publicized using them? Is it because the color red is a warm color? Why are solar owners not using powerful batteries that do not ever need to be replaced? The electricity stored in the batteries must first be converted from a direct current (DC) of electricity to an alternating current (AC) before it can be used by regular household appliances. In order for this to happen, the electricity goes through an inverter that changes the electrical flow from DC to AC. In the picture, there are two identical inverters. “Why is this?”, you may be asking. If one fails, the other will be ready to fill in and supply the home with electricity. After all, they are off the grid and not wanting to be without electricity. There are also two generators on line in case one of the generators fail. Most off-grid systems have some type of backup generator that can create electricity in the case the primary source of electricity is not being supplied. In their case, because they are relying on solar, this happens when there are numerous cloudy days in a row. They opted for propane, water cooled generators that have low RPMs (rotations per minute) to supply the backup electricity. True to the individual’s building style, there are not one, but two generators, one acting as backup – just in case. Because their systems are optimally efficient, in 10 years, only one of the generators has been used only for 291.3 hours, an amazing average of under 30 hours per year! 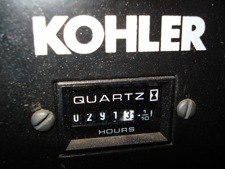 I took a picture because I was amazed that only 291.3 generator hours had been used in 10 years. There are also solar thermal – hot water panels that supply the garage with heat and also utilize a closed loop, gravity fed water drain back system. 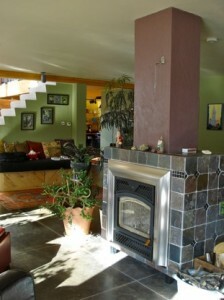 It heats the area simply from radiant heat. “It’s stone age technology from the Greeks and Romans, but it still works – it’s hydronic heat.” Ken said as he summed up the work that was put into the house. He’s one smart guy. He and his wife Kris are incredibly fortunate to be living by and large without utility bills. I was getting slightly overwhelmed as my mind started working out the different redundant efficiencies that were built into the house. 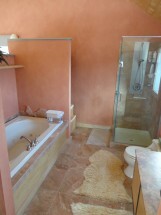 This house was sold by the original builders. They decided to move to another area, but I’m told that they have solar on their new house. 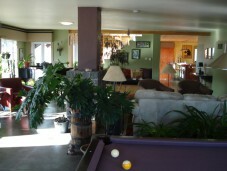 The home is about 2700 square feet. It was built in one long summer. Hi, i was wondering why the PV panels have this shape? Is it more efficient? 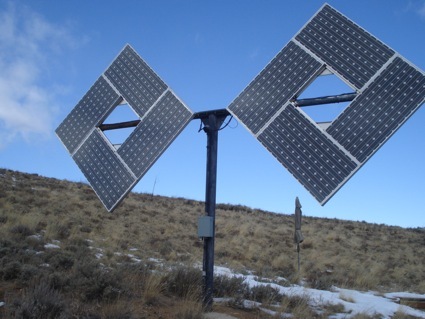 I think the PV panels are shaped in that way, just to keep them off the ground, and mounted. Its configuration does keep it cooler, and more efficient, since air can circulate around them. As a general rule, as a PV panel warms and gets hotter, its efficiency decreases. No, our battery box is not insulated because it is kept in an insulated garage. We get temperatures to -25 F. Everyone else in our area keeps their batteries outside and not insulated which is a bad plan. This causes inefficiency. Suggest you put your battery bank in your garage, if you have one. It doesn’t necessarily need to be heated. I love everything about this home. I am looking to build a home with an attached greenhouse in Park County. Would like to get some information and talk to people who have done this as well as you two have. My home will be smaller 1200-1400 SF with an attached greenhouse of approximately 1000 SF.